Interceptor Flavor Tabs are used in dogs and puppies to prevent heartworm disease, control adult hookworm infection, and remove and control adult roundworms and whipworms. In cats and kittens, Interceptor Flavor Tabs prevent heartworm disease and remove adult hookworms and roundworms. Interceptor is a Novartis developed drug that has been designed to help prevent heartworms, but it goes further. There are two main varieties of this product, one for dogs and one for cats. Both require a prescription from your veterinarian. The medicine is given to your pet as a flavored tablet that they chew and swallow in order to ingest the medicine. There are size requirements for each dosage so be sure to pay attention to these before you give your pet any flavor tab. Interceptor for Dogs and Puppies prevents heartworms, removes mature roundworms and whipworms while controlling hookworms. Interceptor for Cats and Kittens prevents heartworms while removing mature hookworms and roundworms. Before treating a dog or cat for heartworms, they must first be tested by your veterinarian. This should happen every 6 months so if it has been longer than 6 months since your pet was tested, it should be done again before giving them this medicine. Interceptor was designed as a full spectrum treatment that is given to your pet each month to help protect them against all of the parasites mentioned above. Since humans can become infected with roundworms and hookworms, it is important to use this type of medication to keep your dog free of these parasites. This brand has been proven effective for many owners of dogs and cats that had frequent incidents of worms so it is commonly turned to as a solution to help pets be parasite free. Used monthly, parasites are not allowed to settle in and begin reproducing to create an infection. Failure to treat these types of worms can lead to serious medical complications for your pet, so deciding on a strong brand such as Interceptor as a treatment is a sound idea you should discuss with your veterinarian. Interceptor is used in the prevention of heartworm disease and in the control of hookworm, roundworm and whipworm. Interceptor is available by prescription as chewable Flavor Tabs. 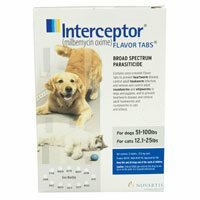 Interceptor is FDA approved for use in dogs and cats. The usual dose of Interceptor for dogs 2-10 pounds is 2.3mg, 11-25 pounds is 5.75mg, 26-50 pounds is 11.5mg and 51-100 pounds is 23mg given once a month year round. The usual dose of Interceptor in cats 1.5-6 pounds is 5.75mg, 6.1-12 pounds is 11.5mg, and 12.1-25 pounds is 23mg given once a month year round. An alternate treatment is to give this medication once a month during the mosquito season and also one month after the season ends. Consult your veterinarian for the dose of Interceptor when used to treat other parasites. Side effects of Interceptor are rare although some animals may exhibit depression, drowsiness, vomiting, loss of appetite, diarrhea, hypersalivation, seizures and weakness. Keep this medication in the original box. Do not remove the tablet from the foil wrap until ready to give the medication. Keep this medication out of the reach of children and pets.